Talented artists on staff to design your custom tattoos in Ft Wayne, IN. 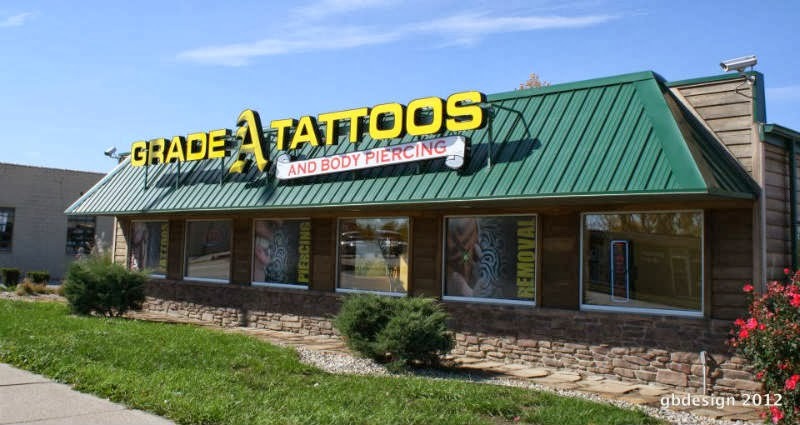 Grade A Tattoos & Body Piercing offers safe, artistic and professional body art and piercings in Ft Wayne, IN. When it comes to tattoos in Ft Wayne, IN, nobody has the level of safety and standards as Grade A Tattoos & Body Piercing. Staffing our tattoo shop with the most talented artists in the city, our design technique combined with our commitment to safety and attention to detail, places our work far above the average tattoo parlor. Whether you're interested in body piercing or finding a tattoo artist you're comfortable with, we're happy to answer any questions and explain our process to you. With an autoclave on the premises, you can guarantee that every tool we use is kept at the highest level of cleanliness possible. We make sure our hands are gloved from beginning to end, each needle is used one time ONLY and the body piercer and tattoo artist will always open a new needle right in front of you to make sure you understand your health is our priority! From an excellent selection of body jewelry to choose from and the only shop in the area to boast laser tattoo removal services, there's no better place for your tattoo and body piercing needs! Stop in or call us at (260) 485-8258 today! We opened our tattoos in 1998. We are located at 3615 N Clinton St, Fort Wayne, IN. See more Grade A Tattoos & Body Piercing photos.